Even though their biggest competitor in the rhythm video game genre is now essentially dead, the people who started the Guitar Hero franchise say they were saddened to hear that Activision had put the seminal music game to sleep. Harmonix Music Systems, who created the original Guitar Hero, call the discontinuation of Guitar Hero and the associated lay-offs that will affect hundreds "discouraging news for fans of the band game genre." Rock Band, their own creation, will thankfully live on, so Harmonix extended an olive branch to those allied with Guitar Hero. "We're continuing to invest in the franchise and the brand that we have built, and will do our best to serve all loyal band game fans," reads a statement. "For rhythm gamers out there who haven't yet given Rock Band a chance, Rock Band 3 software is compatible with a wide range of instruments, including most Guitar Hero controllers." The full response is after this. 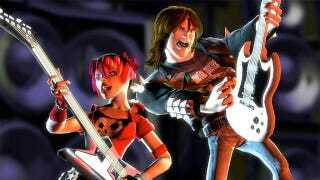 We were sad to hear yesterday that Activision was discontinuing development on Guitar Hero. Our thoughts are with those who are losing their jobs, and we wish them the best of luck. The discontinuation of Guitar Hero is discouraging news for fans of the band game genre. As retail sales of Guitar Hero and Rock Band titles have slowed with time, we've been focused on building a robust digital platform for music gaming and have recently crested 2,500 songs available for play within Rock Band 3. Harmonix and Rock Band continue to push beyond simple performance simulation to pioneer new approaches to music gaming. Rock Band 3 saw the introduction of our innovative new Pro Mode, in which aspiring musicians of all ages can develop actual musical skills through gameplay on guitar, bass, keyboards, and drums. We're looking forward to the imminent release of the Fender Squier Stratocaster Guitar Controller, a fully functional guitar which doubles as a Rock Band Pro controller (launching March 1st). We are also relaunching the Rock Band Network, a way for bands of all shapes and sizes to get their music into Rock Band. RBN just passed the 1000-songs mark, and its relaunch will now support keyboards, pro drums and vocal harmonies. The music genre is one that calls for constant reinvention, and Harmonix is continuing to welcome and embrace that call. In short, the beat of Rock Band marches on. We're continuing to invest in the franchise and the brand that we have built, and will do our best to serve all loyal band game fans. For rhythm gamers out there who haven't yet given Rock Band a chance, Rock Band 3 software is compatible with a wide range of instruments, including most Guitar Hero controllers. Looking to the future, for fans that want to switch, we'd happily welcome you over into the world of Rock Band. It's been a wild battle of the bands since 2007, but we respect and appreciate all of the hard work and innovation of our peers who have shared the music gaming space with us, and we look forward to rocking in the future.